Eyes must be removed within 4- 6 hours after death. The eye bank team will remove the eyes from the home of the deceased or from a hospital. Eye removal does not delay the funeral since the entire procedure takes 20-30 minutes only. A small quantity of blood will be drawn to rule out communicable diseases. Eye retrieval does not cause disfigurement. Give the correct address with specific landmarks and telephone number to enable the eye bank team locate the place easily.
' 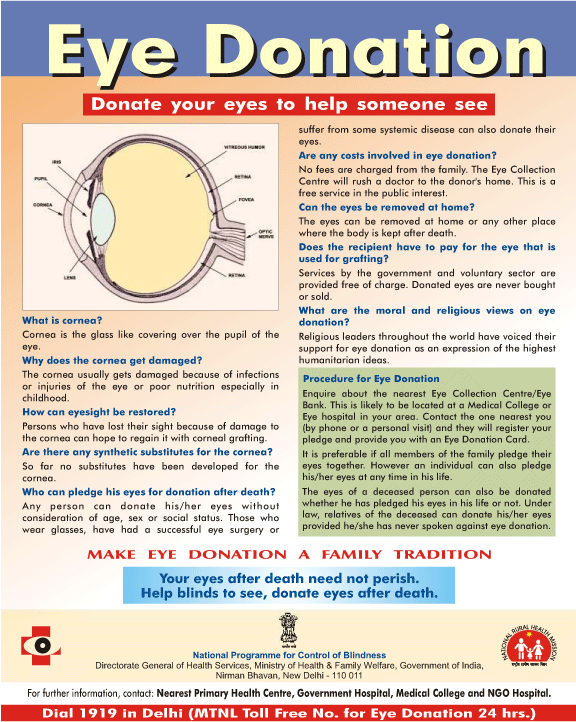 Donate your Eyes ' to help someone see .